I actually like the one we have. It feels retro. Then again, I love brutalism. Great news. The only thing I like about the current terminal is its original entrance (see below), but that's not even in use anymore. It's now hidden behind a new and much cheaper set of ticket kiosks. The interior has been likened to a holding pen for refugees. Either way, the existing terminal is not equipped to handle the crowds that use the ferries in the summer months. We need something spacious, comfortable, and elegant. This is a chance to make up for all of the conservative condos and office buildings we've been building on the waterfront. Sort of off-topic, but the ferry terminal should really be Presto-enabled. I love brutalism too, and the terminal has some nice aesthetic details, but it's completely ill-equipped for the task for which it's intended. Waiting for a ferry, packed in with hundreds of families and screaming kids, in a small space with no shade on an August afternoon? Not fun. I can't wait until we get a new terminal. JasonParis, Presto is a good idea. The fare system is a mess right now. I'm getting old, I remember the old ferry terminal (I was a kid!) and when this was the "new terminal"! This is way overdue given the crowds and how poorly functioning this whole space is. I stopped going to the Islands because of the slow, forever lineups, along with the poor maintenance (no maintenance) of the north end of Hanlan's Point. Given that this is in the hands of Waterfront Toronto I'm very excited about this project, and confident it will be done right. dt_Toronto_geek, you don't really need to be held hostage to the line-ups. The line up of greatest concern is for ticket sales. If you buy your ticket in advance (I think this can even be done on the internet now or soon). You just go straight past the line-up and wait for the ferry. There was a city council motion a while back proposing this very thing, however I lost track of it so I don't know what the status of that motion is right now. Seems like a no-brainer to be honest, although it also seems obvious for the bike sharing network yet I've heard nothing about this. The new terminal should better separate Centre Island-bound ferries and those headed to Hanlan's and Ward's. Centre Island-bound ferries are the most crowded (Centreville/Olympic Island events) and where bicycles are not permitted on summer weekends and holidays. The crowds headed to the other ferries are smaller, more relaxed and will have their bicycles with them. Also, move the ticket counters off to the side of the main path - so that it's clear that there are two separate line-ups: the turnstiles to surrender tickets/show passes (or tap Presto) to board and another one to buy those tickets. It's not clear that the ticket lines can be bypassed as it is now. Yes, and full shade would be a very nice thing. 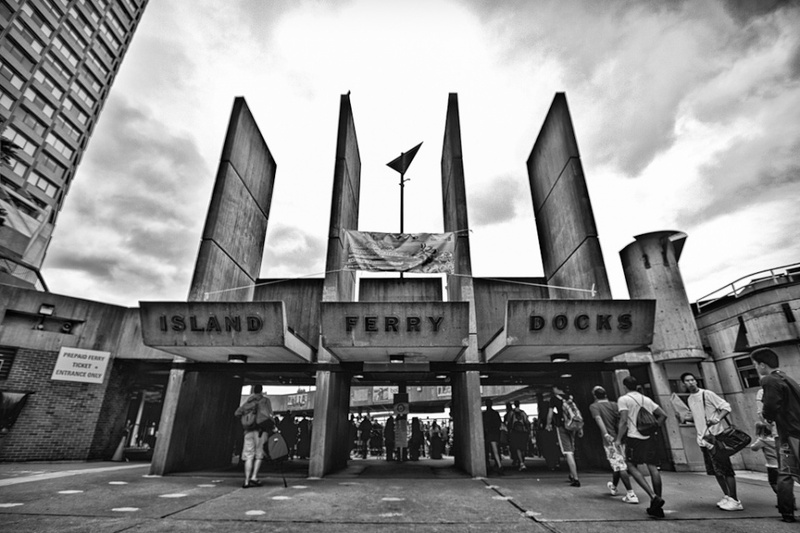 The ferry docks are a rare whimsical example of Brutalism. Those thin concrete slabs rising above gates, for instance, recall sails. However, the experience of using the space isn't pleasant in crowded conditions. The ferry docks should be rebuilt. They need to be ambitious with the revitalization of the park and waterfront promenade--even as far as reconfiguring Harbour Square's parking garage and the oversized podium of the Westin Harbour Castle to free up more public space. The new Ferry Terminal—at minimum the entrance to it—should be visible when walking south on Bay Street. The current terminal is hidden off to the side. Moving the ferry terminal slightly west would move it away from the base of the Westin Harbour Castle hotel, and that would accomplish two things. It would allow the Westin to rebuild their face on the water, which now is dreadful. It would also allow a continuation of the Waterfront Trail around the hotel on the water side. Moving the terminal west would also allow them to build a new terminal while keeping (at least parts of) the old one operating. Would love for them to spend some $$$$$ and build architecturally stunning terminal!! Well, this is really good news, depending on the design of course. I'm anxious to see the details. 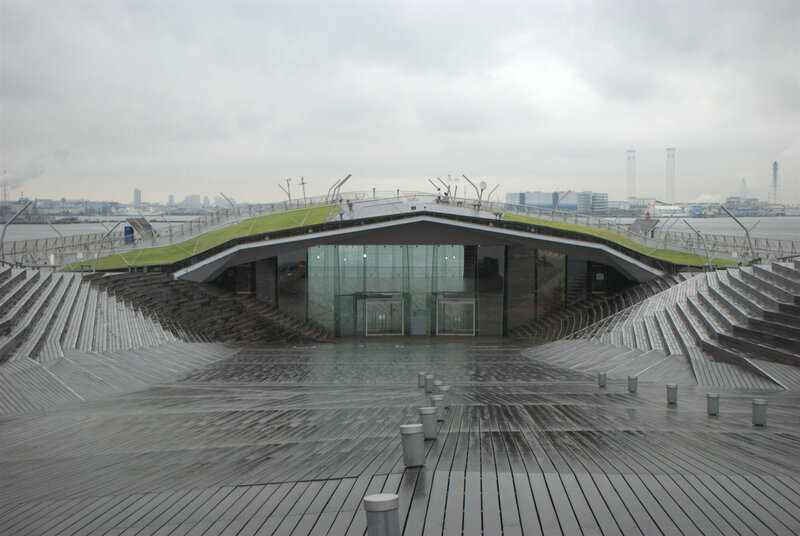 Maybe something along the lines of the Yokohama Ferry Terminal; something you can walk on, so you can always walk along the edge of the water (plus, it looks a lot like our current WaveDecks). That looks terribly slippery when wet, though. A direct connection to the streetcar station would also be nice, from a pedestrian and dirver safety point of view. Somehting wheelchair accessible too given there is a requirement to make it so if there is new construction or substantial reno. What would make my day is actually a two level terminal with Ward and Hanlon connecting to the upper deck of the ferries via a fixed bridge from the upper level of that terminal. Then the Centre Island traffic would remain on the lower level. I hope they also have something in the design that allows for better offloading of passengers when they arrive back in the city. Anything that would reduce congestion in the building design would allow for quicker turnaround and more trips.